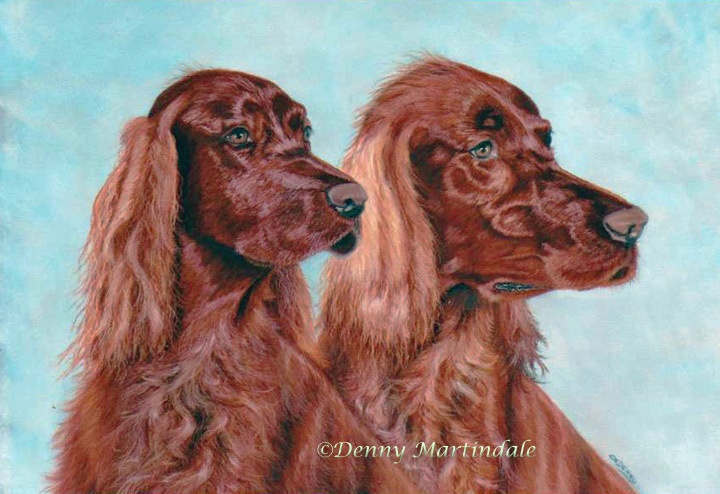 they were having trouble photographing these two Irish Setters and asked if I could take some photos of them. We drove out to her friend's farm on a spring day in March. Their owner took them out on leashes and the three of us attempted to make them cooperate for the cameras. They were a bit excited and then the winds picked up which seemed to amplify their excitement. I finally suggested that they just stand and have a relaxed conversation and let the dogs move around on their own. They finally settled down some and I ended up with a dozen or so shots between the two of them that would aid me in the details of their features. This is the resulting pastel portrait.